In some ways, making your own smoothie is simple. Just throw all the ingredients in the blender and whizz it up until smooth. And after a few disasters, we all know how bad we feel when we waste expensive ingredients and our smoothies are inedible. So I have created the perfect guide to making a smoothie healthy and tasty every time. The smoothie you are about to create will be for 2 servings, approximately 2 pints. So you’ll have some to share or some for later. If you only want one serving, half all the ingredients. It depends how much water is in your fruit. The more water in the fruit the more you can add. The creamier the fruit, the less you need. These can be fresh or frozen. Frozen fruit will make your smoothie cool but you might need more liquid as they will make the smoothie thicker at first. If you are combining fruits, add 1-2 cups of creamy fruit with 1-2 cups of non creamy fruit. Spinach, Kale or other mild greens: To turn your smoothie into a green smoothie add 2 cups of greens. These are easier to blend with the liquid before adding the rest of the ingredients. If using frozen greens add them nearer to the end. 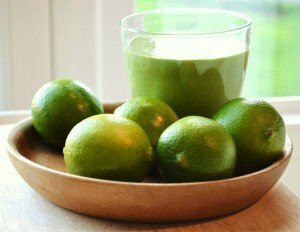 Juice of 1-4 limes or lemons. 1/4 Cup of fresh herbs such as parsley, mint or basil. If you use Coconut milk as a base it will make all your smoothies taste rich, creamy, and deliciously sweet. You won’t need much else apart from fruit and coconut milk and perhaps some sweetener if you like it extra sweet. 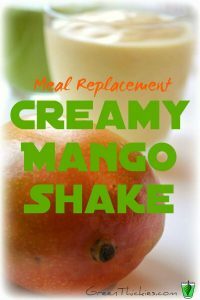 You will fall in love with this 4 ingredient Creamy Mango Shake once you’ve tried it. If you want a low calorie smoothie, it’s better to use water as your base as it contains no calories. Use berries for most of your fruit and either sweeten with a few dates or some bananas. Try this Berry Smoothie recipe. To make a more filling smoothie, you can’t go wrong with 1 cup of oats. They are neutral in taste so you can add them to all smoothies and make your smoothie more creamy. Or you can add more filling fruits such as bananas, mango and dates. Coconut milk, nuts and seeds will also really fill you up. For a healthy sweet treat, try this Homemade Cookie Dough Smoothie. One easy to way to make your smoothies more refreshing is to use an orange juice base and citrus in your smoothies, such as lemon and lime. For a beautifully refreshing smoothie try this Sun Dream Orange and Banana Smoothie, or the ever popular Key Lime Pie Smoothie for a refreshing indulgent treat. Berries are full of antioxidants so chuck some frozen berries into any smoothie to give it a healthy boost. Give this Broccoli and Blueberry smoothie a try for an amazing health kick. If you want to make a more cleansing smoothie, try adding cucumber, celery or ginger to your smoothie. Try this gorgeous Pineapple and Strawberry Smoothie with hidden celery. If you need your cool smoothie to give you a warm glow, try adding a teaspoon of ginger or cinnamon to your smoothie, or a pinch of cayenne to taste. This Spicy Plum Smoothie will give you a warming treat, or this Lime and Ginger drink will give you a real kick. If you want to give any smoothie a tropical flavour, just add either pineapple, coconut, mango, papaya or passion fruit. Give this lovely tropical smoothie a try. If you want a smoothie to reduce your cravings for desserts, try adding 1/4 cup of cocoa powder and some sweeteners to your smoothie for a healthy yet indulgent treat. 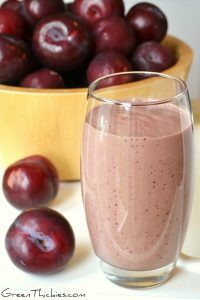 Try this Chocolate Cherry Smoothie to satisfy all your cravings. You can replace the cherries with other berries, oranges, bananas or whatever fruit you want. Do you want to try a Green Thickie? This basic Green Thickie Recipeis the perfect starting point. Start off just blending your liquid with some of your fruit slowly at first. When the fruit is submerged in the liquid add some more of the ingredients at a time until everything is blended. Depending on your blender you may have to add more liquid or stop and scrape down the sides of the blender after turning it off first. You may have to blend your smoothie from 1 minute to 5 minutes depending on how good your blender is. A high speed blender will make the perfect smooth smoothie every time. Or you can have a look at my resources page for blenders I recommend to suit your budget. If you want some more smoothie recipes, this smoothie recipe book has got to be my favourite that I’ve ever tried (and I’ve tried loads!) 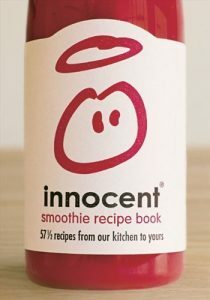 If you’ve never tasted Innocent smoothies, they are a British brand sold in mainstream shops, and now they are sharing all their secrets with you. I’ve loved all the recipes I’ve tried from this book so far, and it’s so beautifully laid out, you’ll be truly inspired into healthiness. 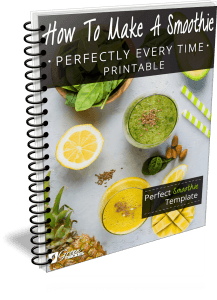 I hope this has helped you to create your own perfect smoothie. What is your favourite smoothie recipe? What a great tutorial! It’s funny I’d been making some pretty terrible smoothies lately, but this morning my smoothie-making mojo was back in place. If I had seen this earlier I might have been spared my barely-passable concoctions. I really like the tip on adding cinnamon or ginger to smoothies. I do this randomly, but always forget it can actually give some warming qualities to my smoothie- will definitely come in handy soon- it’s getting so cold out! we love smoothies! I try to make them for breakfast at least once a week! Great way to break it down; I never thought about the watery vs non watery fruits before! Another tip: consider the flavors of the various things you’re adding, and make sure that they go well TOGETHER (particularly the strongly-flavored fruits/veggies; some are mild enough that they just get covered up anyway). Some combinations just don’t work well! What a great tutorial! This makes it really easy to customize, and I’d never thought of adding quinoa or squash to a smoothie. I know what I’ll be playing around with today (I’m thinking warm ginger and sweet acorn squash smoothie now). Great Post! Hope you are having a great fall weekend and thank you so much for sharing with Full Plate Thursday. I printed out your 5 steps and let my daughter pick her ingredients. She made a yummy ‘tropical’ pineapple/mango/fermented oj/flax seed/spinach smoothie and drank it all! This breaks it down and makes it so easy to pick and choose great ingredients. I tacked it to my cupboard right by my vitamix to reference for smoothie making. Thank you! Wow, these are great instructions! Something I could use as the smoothie making process is often mysterious to me. Thanks for sharing on Natural Living Mondays. Hi Katherine! This looks like a great formula for smoothie-making! :-) My typical go-to is almond milk, almond butter, frozen bananas, vanilla, yogurt, and spinach, but I need to branch out! I’ll have to try your chocolate cherry version! Thanks for the ideas! Thanks so much for sharing this on Meatless Monday, and sorry it took me a while to get back to you- I was hit with Hurricane Sandy! 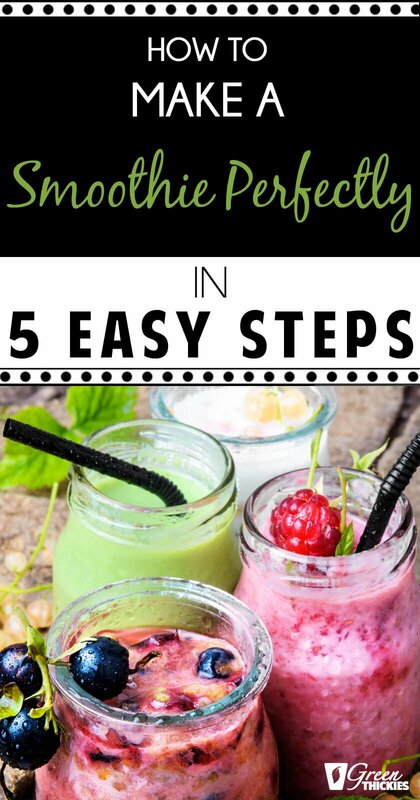 This is a really helpful post, thanks….My husband and I have a green smoothie every morning. I grow kale in my garden and have it fresh as the ‘GREEN.” I also put into each one 2 TB flax seeds, 2TB hemp hearts, 1 TB chia seeds, 2 TB dried mulberries, 2 TB cacao nibs. I also put in a frozen cube of wheat grass, frozen blueberries and then a variety of fruits and veggies I have in my fridge at any given time. I am a senior and I have so much energy I can hardly keep up to myself! My kids are nuts about making their own smoothie. I will pin the steps for them. Great tips. Thank you, so glad it will be a help for your kids! Do you soak the buckwheat before you make a smoothie? Thanks for this. I’m trying to add healthy calories to my skinny son’s diet and yet avoid all the things he’s allergic to: almonds, dairy etc. I think I’m going to try and slip in an avocado – which he hates – and see if I can disguise it. If only he liked bananas. Thank you very much for these tips.please i do have a question,what if i use diary milk in my mango shake.is anything wrong with that? 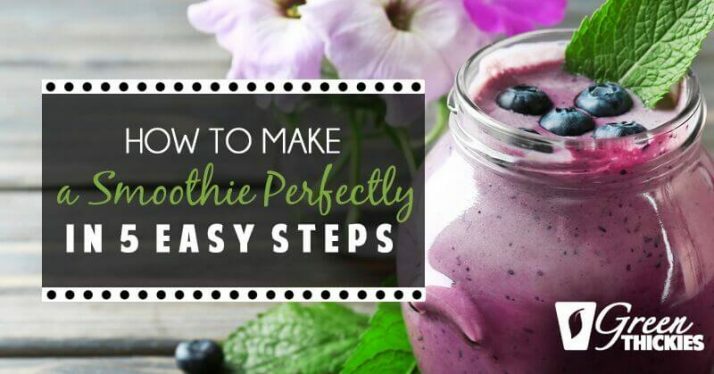 Perfect tips on how to make a smoothie, really a big fan of the infographic as well! Hi I just came across your article here and I wanted to say I enjoyed it. I have been making green smoothies for a while now but I never thought to try adding a filler like you suggested of oats or quinoa but I will be trying it this weekend!